AMAZING PRICE! Northwest Territory Eagle River 18′ x 10′ 8 Person Tent ONLY $64.09! Couponista Queen earns a small commission on her Shop Your Way client sales. AMAZING PRICE! 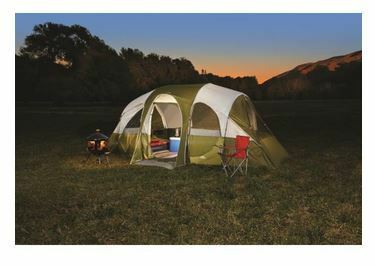 Northwest Territory Eagle River 18′ x 10′ 8 Person Tent ONLY $64.09! Pay ONLY $89.99 and Get Back $25.90 in Points making it ONLY $64.09 After Points Back! 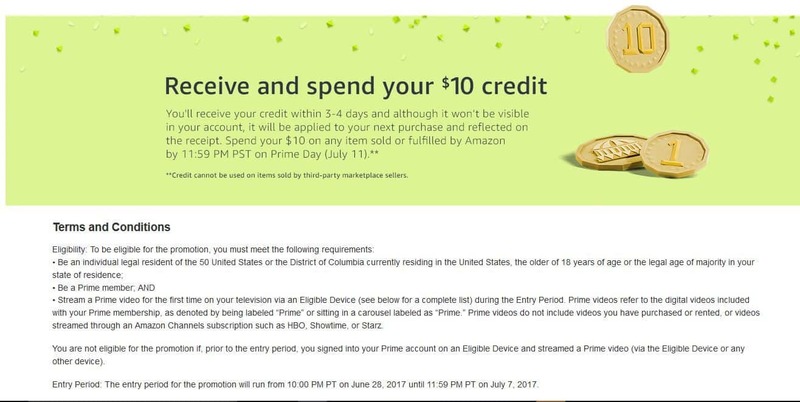 Stream a Prime Video and Get $10 to Spend! We are affiliated with the Amazon Associate’s Program. By clicking our links, we potentially earn a small commission on sales through our links. 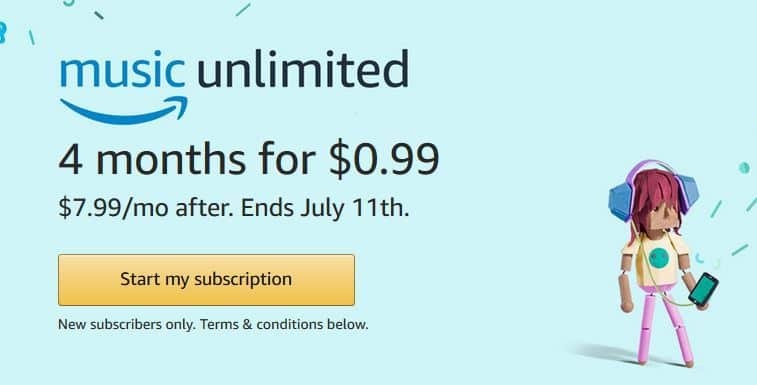 Stream a Prime Video for the First Time and Get $10 to Spend by Prime Day! WHOA! Select 3 Wick Candles ONLY $10 PLUS $10 Off $30 at Bath & Body Works! WHOA! Select 3 Wick Candles ONLY $10 PLUS $10 Off $30 at Bath & Body Works! Use code INEEDTHESE. Prime Music Unlimited ONLY $.99 for 4 Months! Prime Music Unlimited ONLY $.99 for 4 Months! New Subscribers! HOT!! Amazon Now Offering FREE Shipping NO Minimum!!! DEAL OF THE DAY! Sport-Brella Portable All-Weather & Sun 8 Foot Umbrella! FREE PRIME SHIPPING! Sony PlayStation Plus 1 Year Membership Subscription Card ONLY $47.99! DEAL OF THE DAY! BLACK+DECKER 10 In. String Trimmer/Edger & Sweeper Kit ONLY $44.29! FREE SHIPPING! DEAL OF THE DAY! BLACK+DECKER 10 In. String Trimmer/Edger & Sweeper Combo Kit ONLY $44.29! 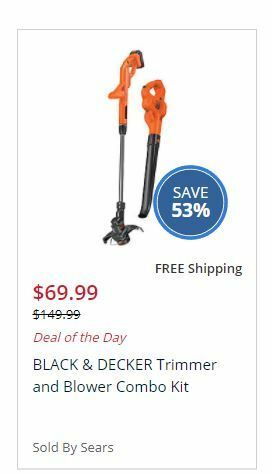 Add the String Trimmer to your cart! Deal of the Day price is ONLY $69.99! You will get Back $25.79 in Points making it ONLY $44.29 AFTER Points Back! Shipping is FREE! ToysRus Summer Savings Blast! Buy 1 Get 1 50% Off ALL Pool & Water Toys & MORE! UGG Closet! Up to 50% Off New Markdowns! Ends July 4th! Shop Your Way Members Get a $1 Down Layaway at Kmart! Mark Your Calendars!!! PRIME DAY Returns July 11th! SEARS! Extra 20% Off Clothing Purchase of $50 or 15% Off $49.99 & Under! Shop Your Way Members! 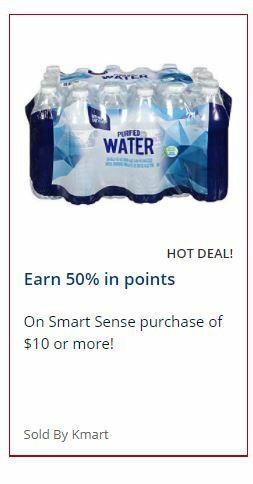 Earn 50% in Points on a Smart Sense Purchase of $10 or more! HOT! Victoria’s Secret Americana Tees & Tanks 50% OFF! Starts TODAY at Starbucks! Buy 1 Grande Iced Espresso Get 1 FREE! ENDS TODAY! 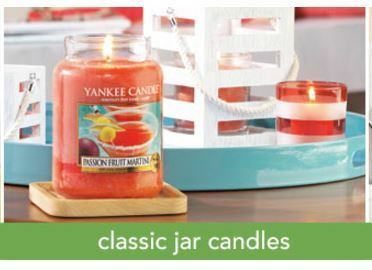 Buy 1 Get 2 FREE Yankee Candles! ENDS TODAY! Buy 1 Get 2 FREE Yankee Candles! Get Your Coupon NOW! HOT PRICE! 299 Piece First Aid Kit! FREE Prime Shipping! DEAL OF THE DAY! Intex Pillow Rest Raised Airbed with Built-in Pillow & Electric Pump! FREE PRIME SHIPPING! HOT! Starbucks $15 EGIFT! Grab Yours! WOW! 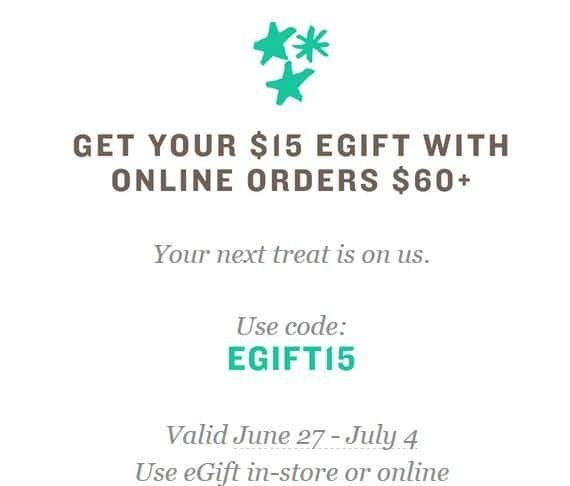 Spend $60 Online at Starbucks & Get a $15 EGIFT for use In Store & Online! Use code EGIFT15 at Checkout! STOCK UP PRICE! Under $9 for Sun Chips Variety Pack of 30! LAST DAY! 20% Off $25 Purchase at Bath & Body Works! Online & In Store! HOT DEAL! 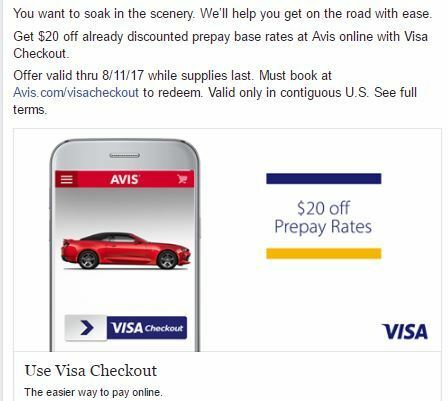 Get $20 Off a Car Rental with Avis & Visa Checkout! Free Bloomin’ Onion TODAY ONLY at Outback Steakhouse! Macy’s 7-Pc. Summer Beauty Sampler Gift Set ONLY $10 SHIPPED! YUM! Grab a 50 Cent Frosty at Wendy’s! YUMMM! 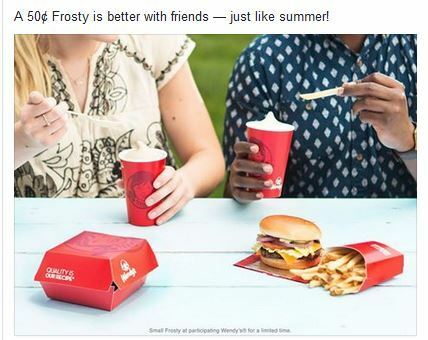 Grab a 50 Cent Frosty at Wendy’s for a Limited Time! $2 Mercari Credit! The Hassle Free Way to Buy & Sell! Get a FREE $5 Credit for Poshmark! 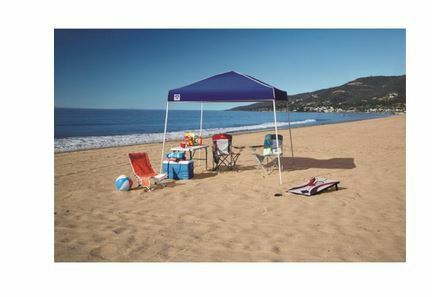 Z-Shade 10’ x 10’ Instant Canopy ONLY $34.59! FREE SHIPPING! 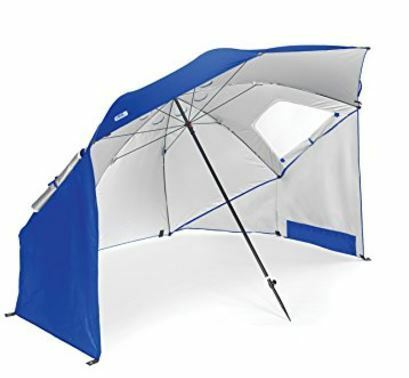 Z-Shade 10’ x 10’ Instant Canopy ONLY $34.59! FREE SHIPPING! Add this Z-Shade Canopy to your cart for ONLY $39.99 and SYW Members get FREE Shipping and $5.40 Back in Points! Making it ONLY $34.59 AFTER Points Back! HURRY! EXTRA 20% OFF Sale Styles at Converse PLUS 12% Cashback! HOT! 6pm! Free Shipping! NO MINIMUM! WOW! 10′ Hanging Patio Umbrella ONLY $54.99 SHIPPED! 3 Colors! MICHAEL KORS Mercer Logo Duffel ONLY $111.75 Shipped PLUS 8% Cashback! MANY COLORS! HOT! Yankee Candle! 6 Large Candles for ONLY $60! WOW! 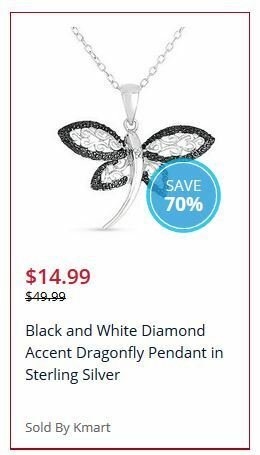 Black & White Diamond Dragonfly Pendant ONLY $14.99! WOW! Under Armour Storm Hustle II Backpack ONLY $27.19! MANY COLORS! HOT Starbucks Coupon! 50% OFF a Macchiato for a LIMITED TIME!